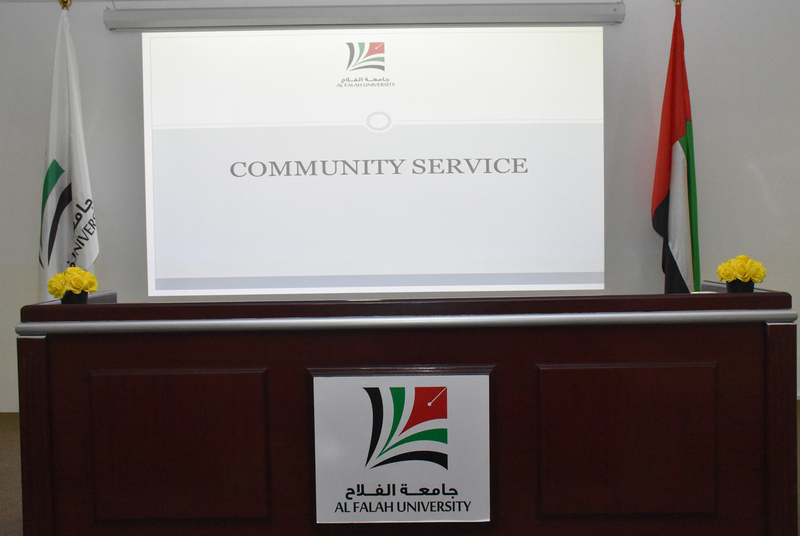 Al Falah University (AFU) College of Business Administration (COBA) is committed to community engagement and community service. The intention is to organize faculty and staff expertise, as well as the University’s facilities, equipment and learning resources to provide recurrent benefits to the community beyond the classroom, while regarding the community as a prime stakeholder in the continuous development of the University’s programs and services. The goal of faculty and staff involvement in active community service is to generate support for the University from external stakeholders, by means of identifying specific needs that can be filled by faculty competences, whether these needs are articulated or not, and by encouraging faculty and staff members to meet these needs in ways that can generate recognition for the University. The intention is to create shared value in a strategic way that allows both the University and the community to benefit from this interaction. It is important to differentiate between professional and community service. Professional service consists of faculty engagement with (a) his or her discipline, by means of serving as conference panel conveners or keynote speakers at professional association meetings, for example, or taking a leadership role in such an association (b) his or her College and University, by contributing effectively to committee work, as well as fulfilling administrative roles, when invited to do so. In turn, community service consists of documented outreach, using faculty expertise, institutional facilities, equipment and learning resources to provide benefits to community groups beyond the classroom, while also enhancing the University’s reputation. The Commission for Academic Accreditation requires licensed UAE institutions of higher education to demonstrate their service to local community needs. Accordingly, faculty/staff community activities need to be included in annual evaluation criteria and professional development plans. The College’s Community Engagement Committee will include the elaboration and implementation of AFU’s community engagement plan, as well as its continuing evaluation for the purposes of quality enhancement. The Committee will work in collaboration with faculty members, and will lead in establishing the initial Community Engagement Plan. The College Advisory Council may provide feedback regarding the co-curriculum and community engagement plan evaluation. This Committee will also help to ensure that all community activities are consistent with the mission of the University. The Committee Chair will explore additional opportunities for relevant faculty and staff to contribute their expertise to community partners in business, industry and the government. The community activity of program faculty will be included in their annual performance evaluations, as well as their professional development plans. All of the University’s faculty and staff are kept informed of AFU’s community engagement agenda by emails, posters, text messages, and social media, and are provided with structured opportunities as desired to contribute to program initiatives, and to suggest new ideas. For COBA, community engagement may be viewed as a win-win proposition, one that also enriches the experience of participating faculty and staff members, potentially also providing practical experience that can feed into research-led teaching. Within the framework of interaction with the community organized by the College of Business Administration at Al Falah University, a lecture took place for faculty and administrative staff entitled "Leadership Skills and Knowledge Management" by Dr. John Girard (Professor of management at Middle Georgia State University and participant at the Fulbright Scholarship program). That explained how to take advantage of the information or “Big Data” which is available on the Internet and its contribution to the work of researchers. Al Falah University in coordination with College of Business Management organized a lecture on Human Resource Management Practices and Challenges in the Middle East, delivered by Mr. Saleh Al Hammadi, Regional Director of Human Resources in the Majid Al Futtaim Group. Mr. Hammadi addressed during the lecture the aspects of the challenges and practices in human resource management in the Middle East. He also reviewed some of the models and modern methods used to best corporate practices in various countries around the world. Al Falah University is seeking through lectures and workshops the methods to link the theoretical to practical reality application which will allow the students to join the labor market after graduation with innovative solutions. Al Falah University participated in the Clean Up the World campaign 2016 organized by the Dubai Municipality under the umbrella of the United Nations Commission for Environment (UNEP). Academic and administrative staff of Al Falah University helped clean the parks, neighborhoods and public places located near the campus. The campaign aims to raise awareness among community members of preserving the local environment and how each individual could participate in keeping the world clean. The Clean Up the World 2016 social environmental campaign calls on individuals and groups from around the world to clean up, fix up and conserve their local environment. 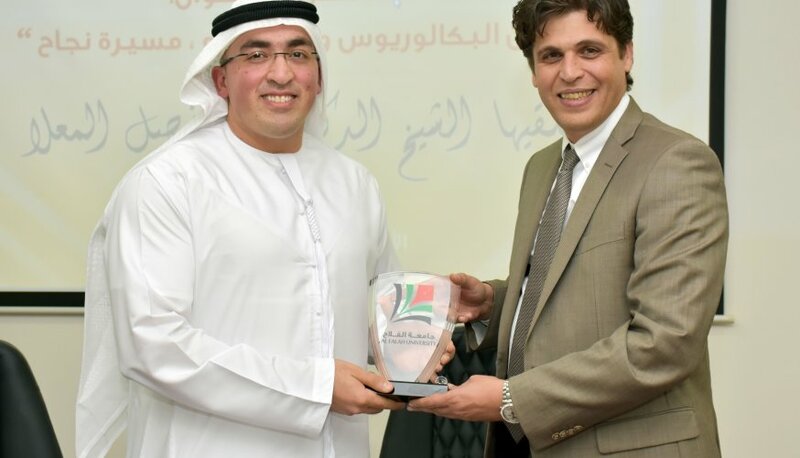 Al Falah University celebrated the 45th National Day of the founding of the United Arab Emirates in the presence of the University’s Chancellor, Dr. Noor Aldeen Atatreh and Vice President for Academic Affairs, Dr. Sameer Al Barghouthi, members of the faculty, administrative staff and students. The ceremony started with the national anthem and reading of verses from the Koran and welcome speech from Dr. Atatreh. A number of university students submit poems and passages and several recreational activities inspired by the Emirati folklore to mark the occasion. The ceremony also included a tourism exhibitions organized by department of tourism and events management and the COBA that explained the importance of tourism in addition to art exhibitions that shed light on the meanings and values of identity and national loyalty .The ceremony concluded with national dances and traditional art performance interactions with the audience reflecting the love and belonging to the Emirates homeland. Al Falah University collaborated with INJAZ UAE to launch a workshop entitled “Innovation Day” today for the benefit of AFU and invited students from Canadian University in Dubai. The event held at the AFU Auditorium was organized to guide students in finding innovative solutions through creative thinking. A number of discussed important topics encouraged students to think creatively and to work as a team. A group of volunteers from McKinsey Consulting shared experiences and knowledge with the participants to encourage broadening of their horizons and directing them towards a future in entrepreneurship. The students gained several aptitudes during the presentation such as presentation skills and how to start a business in an unconventional way. 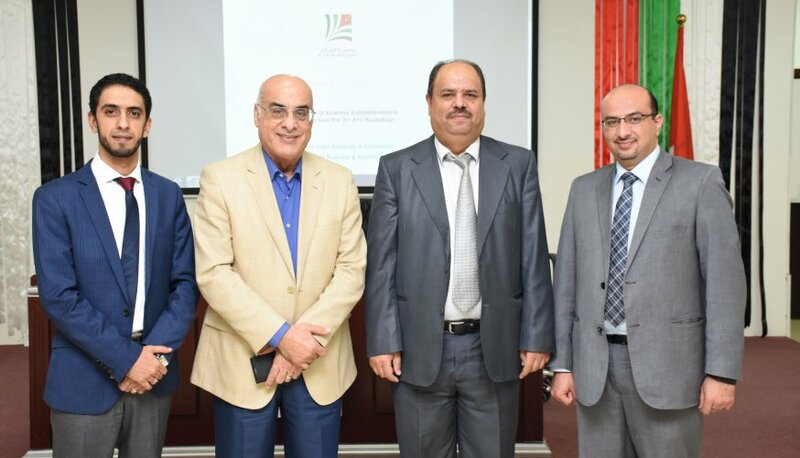 The College of Business Administration at Al Falah University organized a workshop on Business Data Analysis: A Crossroad between Business & Society in which 15 papers were presented dealing with data on scientific problems of interest to the community analysis. Several research papers by COBA and GED faculty members were presented. Prof. Amjad Nasser, Chairman of Conferences, Seminars and Scientific Research Committee opened the workshop and welcome all faculty member participants such as the Vice President for Academic Affairs, Dr. Sameer Al Barghouthi. Dr. Al Barghouthi delivered a speech and congratulated the faculty members in their commitment and effort to research work. Al Falah University signs memoranda of understanding with several universities within United Arab Emirates to strengthen the bonds of cooperation and joint action institutions to be continuously ahead in terms of global developments in the field of higher education. 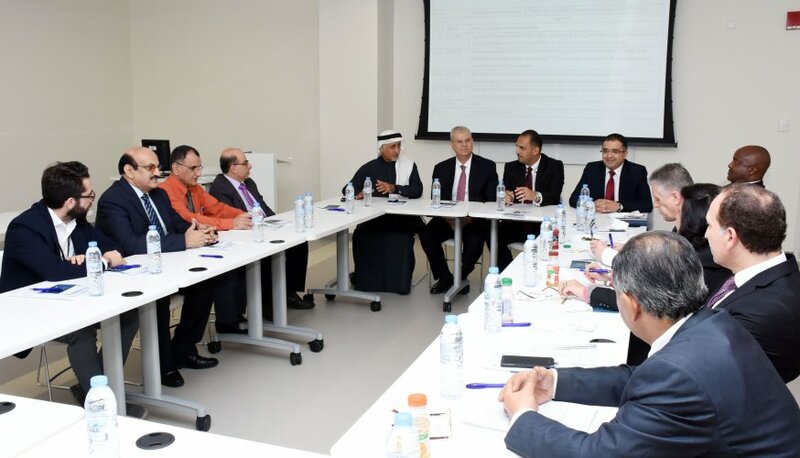 A prior meeting was held and key items were discussed, notably, the exchange of faculty and students between universities in addition to the disclosing of experiences of cooperation in the field of scientific research and community service. 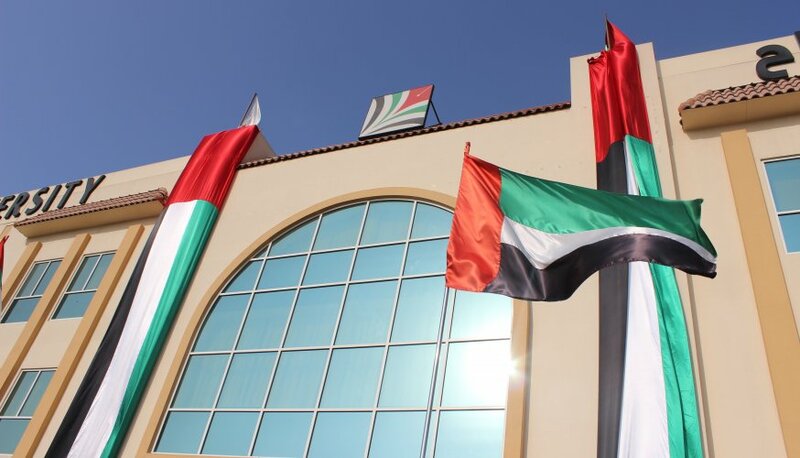 Al Falah University in part of its vision to distinguish itself as one of the premier universities in UAE and the GCC, constantly endeavors to participate in programs of scientific research, to serve the community and to put forth efforts in improving the quality of education in the United Arab Emirates. Al Falah University organized a lecture entitled "Between Masters and Doctoral Level, the March to Success," presented by Sheikh Faisal Al Mualla and attended by AFU academic and administrative staff and students lead by the Vice President for Academic Affairs, Dr. Sameer Barghouthi. At the beginning of the lecture, Sheikh Faisal Al Mualla, Ph.D. researcher in Knowledge Management at Manchester Metropolitan University in the United Kingdom spoke of his personal experiences, his education in various stages of his study and his numerous accomplishments. Sheikh Al Mualla discussed the development of education in the UAE in the recent period through innovative and creative ideas by the wise leadership which mainly concentrated in strengthening the role of the educational system to shape a bright future for succeeding generations in the United Arab Emirates. Al Falah University attended the fifth edition of the Dubai International Exhibition for Government Achievements held under the patronage of His Highness Sheikh Mohammed bin Rashid Al Maktoum, Vice-President and Prime Minister of the UAE and Ruler of Dubai. The Dubai Government Excellence Program to the Executive Council of Dubai organized the event at the Dubai World Trade Center with 80 participants from 20 countries. The delegation of AFU aims to learn about outstanding experiences and creative ideas in various scientific and practical fields through the exhibition.During the exhibition, participants were briefed on the achievements and innovations from the UAE and the surrounding countries. Participants also had the opportunity to learn about the distinguished contributions of more than 50 government entities from Dubai and the other Emirates as well as the experiences and achievements of governments outside the UAE. The College of Business Administration (COBA) at Al Falah University (AFU) will partner with Market Traders Academy to launch and Trading Laboratory, which will provide access to Bloomberg databases and technologies, and other resources that will allow students and participants to experience trading and investment in real time.its Investment This Lab will support the delivery of COBA business curriculum by affording students practical trading and investment opportunities both locally, regionally and internationally. 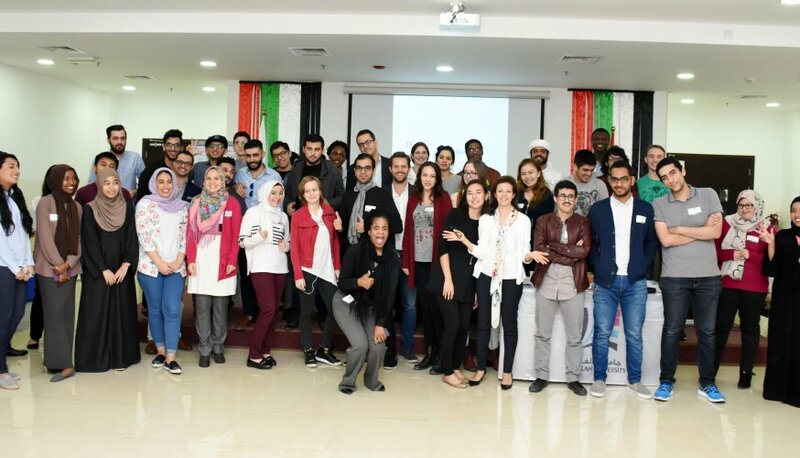 Al Falah University will partner with INJAZ UAE to deliver workshops, seminars, training programs and internships that will help students improve their ability to participate effectively in developing the UAE economy, to become innovative entrepreneurs and to plan their careers with volunteer mentoring from the corporate sector. INJAZ UAE, is a member of Junior Achievement (JA) Worldwide, the world’s largest non-profit business education organization that is a partnership between the business community, educators and volunteers — all working together to inspire young people to dream big and reach their full potential. Through the delivery of cutting-edge, experiential learning programs in work readiness, entrepreneurship, and financial literacy skills, JA Worldwide programs effectively broaden the business skills for young people and enrich their ability to both engage in their own professional development, helping strengthen their future careers. November 10, 17, 24 and on December 8, 2015, from 10:00 AM – 12:00 PM. This is a professional development program that aims to teach the skills needed for a modern workplace and raise students’ awareness on challenges faced as they take the first steps in their professional career path. This program will prepare students to use updated tools and methodologies for skills development and planning, as well as expert training sessions covering concepts in professionalism in the workplace. *Students will be engaged in four sessions of two hours each. Sign up to benefit from this great opportunity! Please email/contact: The COBA Office and/or Student Affairs Unit. The participation of Al Falah students in relevant DGEP training programs, which support delivery of the curriculum. 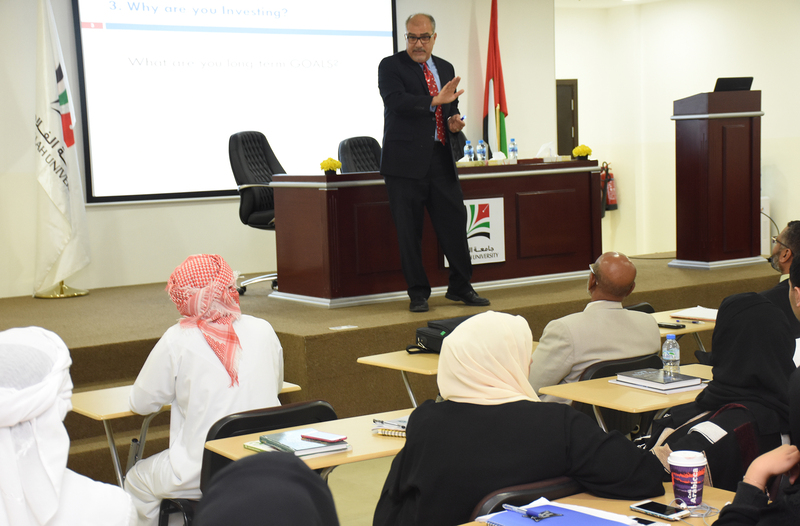 On Monday November 16, 2015, the Securities & Commodities Authority hosted a lecture entitled "Important Decisions in Investment" for the students at Al Falah University.